Brazilian-Italian-American soprano Asleif Willmer is a young and promising artist hailed as “a most incredible voice” by Arizona Daily Star and a “fully-engaged, fine-voiced singing actor” from La Scena Musicale. She is highly regarded for her captivating stage presence, nuanced artistry, and polished lyric-coloratura soprano voice. Equally at home in the concert hall, Asleif is an artist with the GRAMMY-nominated True Concord Voices and Orchestra and has been a featured soloist internationally and nationally with Opera Saratoga, International Vocal Arts Institute in Montreal, Brevard Music Festival, Vianden Music Festival in Luxembourg, University of Arizona, Arizona State University, Mount Desert Summer Chorale, and Tucson Philharmonia Youth Orchestra. 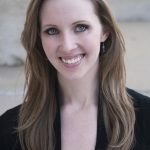 She has received top awards from the Metropolitan Opera Council Auditions, Phoenix Opera Southwest Opera Competition, Dorothy Lincoln Smith Competition, Classical Singer Competition, MTNA Competition, Amelia Rieman competition, and has been a finalist for the ASPS Mary Trueman Art Song Competition. Asleif received her DMA in Vocal Performance from Arizona State University under the tutelage of Carole FitzPatrick.